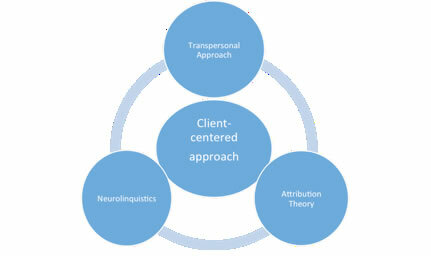 A client-centered approach that combines 1) Attribution theory 2) Transpersonal psychology and 3) Neuro-linguistic programming, can serve as a framework for assisting patients or clients who had a transpersonal experience. For Carl Rogers (1902-1987), a humanistic psychologist, interacting with clients meant letting them be the driving force for discussing their issues. His approach is called client-entered. The approach involves showing positive regard for the individual without judgment. In a client-centered approach the health professional, in an empathetic environment, asks open-ended questions to assist the client in identifying their issues and possible solutions. The approach, unlike the historically authoritative approach used in health care, is nondirective (Rogers, 1951). This client-centered approach is also consistent with a new trend in providing nursing care. According to Oudshoorn, “Nurses are challenged to develop a new way of seeing empowerment practice, and encouraged to focus on 'being with' clients, rather than 'doing to' them.” To be less judgmental the term non-adherent be used instead of noncompliant. Non-adherent is seen as allowing more open inquiries with patients as to difficulties staying with recommended medical treatment (Ofri, 2012). Moody (2001) reports the following conclusions from his interviews with NDErs in the early 70s. Despite their own certainty of the reality and importance of what has happened to them, they realize that our contemporary society is just not the sort of environment in which reports of this nature would be received with sympathy and understanding. Indeed, many have remarked that they realized from the very beginning that others would think they were mentally unstable if they were to relate their experiences. So, they have resolved to remain silent on the subject or else to reveal their experiences only to some very close relative (p. 78). A client-centered approach with positive regard enables the individual to freely express their feelings and beliefs about their transpersonal experience. In 1958, Heider proposed a theory of attribution, explaining people will attempt to understand behavior by thinking of a reasonable cause or explanation. Others (Harvey & Weary, 1985; Jones, Kannouse, Kelley, Nisbett, Valins, & Weiner, 1972) elaborated on this idea and described a major theory of attribution in social psychology. According to Forsterling (2001) when we experience an event, we all try to explain it with whatever education or information we have. We not only see or experience an event, we also interpret and try to explain it. That explanation will have a description of an antecedent event, the attribution and then the consequences. A person may have an experience, say indigestion, remember they ate at a new restaurant, attribute the indigestion to the food there and resolve not to go to that restaurant. If the ‘indigestion’ is severe enough, they may come to the hospital. Tests may show that the patient is having a myocardial infarction and not indigestion. Before someone can convince the patient of the reality of the situation, the healthcare professionals must ask this patient what he believes is happening. Without hearing the patient’s interpretation of the situation, it is difficult to present an alternative explanation that is more accurate. There are many dimensions of Neuro-linguistic programming (NLP) which studies how the mind creates experiences from sensory stimuli. NLP is based on the theory that all thoughts are experienced as either pictures, sounds, smells, feelings and/or taste (Hoobyar, Dotz & Sanders, 2013). Early descriptions of transpersonal phenomena focused on visual experiences. We now know that experiences can be visual, auditory or kinesthetic. When working with a client who has had a transpersonal experiences it may helpful to know how the client weighs visual, audio or kinesthetic stimuli. The early researchers on deathbed communication, for example, described these events as deathbed visions. In fact, not only do individuals see apparitions, they also can hear voices or music or feel them and emotionally respond. In working with individuals who have these transpersonal events, it is important to listen to the descriptive words they use, be they visual, auditory or kinesthetic. It is important to not generalize, delete or distort the person’s description or emotional response. According to Kasprow and Scotton (1999), transpersonal psychiatry does not promote any particular belief system, but rather acknowledges that spiritual experiences and transcendent states characterized by altruism, creativity, and profound feelings of connectedness are universal human experiences widely reported across cultures, and therefore worthy of rigorous, scientific study. Inattention to these experiences and the roles they play in both psychopathology and healing constitutes a common limitation in conventional psychotherapeutic practice and research (p. 12-13). Raymond Moody described this person’s transcendent experience after an NDE: At this time – it was before I had gone off to college - I had grown up in a very small town, with very small-minded people, the people I was associated with, anyway. I was a typical high-school fraternity brat. You just weren’t “it” unless you belonged to my fraternity. But after this thing happened to me, I wanted to know more. At the time, though, I didn’t think there was a person who would know anything about psychology or anything like that. All I knew was that I felt like I had aged overnight after this happened, because it opened up a whole new world for me that I never knew could possibly exist. I kept thinking, “There’s so much that I’ve got to find out.” In other words, there’s more to life than Friday night movies and the football game. And there’s more to me that I don’t even know about. And then I started thinking about “What is the limit of the human and of the mind?” It just opened me up to a whole new world (p.83). Transpersonal experience often alter an individual's understanding of life and world view. These changes can be challenging for family, friends and co-workers. Increased spirituality combined with a less materialistic life view can generate discord particularly with the spouse. When meeting with the individual and/or family members the following approaches have been found to be helpful and consistent with the above framework. Reassure the client that transpersonal experience is an established phenomenon. Event: witnessed/non-witnessed, physical time, duration, location, relevant treatments. sensory symptoms - unusual sounds, smells, tunnel vision, numbness, tingling, or formication. emotional symptoms - inappropriate fear, rage, joy. Environmental triggers: private or public setting, lighting, auditory/olfactory/tactile stimulation, patient positioning during the event. Client description of the time, duration, location and participants. Client description of altered physical and cognitive perspectives during the event. Client description of altered sensory perception: visual, auditory, olfactory, etc. Client requests, needs or desires prior, during and after the event. Emotional and physical response to the occurrence.